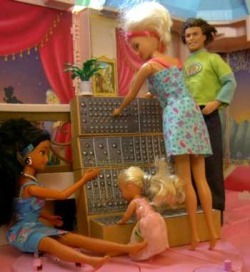 I adore mixing as much as Barbie (left) loves her modular synth. Having learned music by ear before my formal training, I can identify frequencies most of the time at light speed (well, okay - the speed of sound) just by listening. My obsessive perfectionism, otherwise tedious and alienating to friends, is ideal for cleaning and neatening up sessions, making them sound professional and slick and maintaining the energy/feel of a track all at the same time. I have the restraint and experience not to completely strip and quantize the life out of a performance, but the keen ear to bring out the best aspects of it; spot editing for pitch or rhythm flaws that stick out, moderating resonant frequencies to clarify timbre (or, conversely, bumping the EQ where it sounds good), adding depth and working that stereo field by tastefully applying nice-sounding effects treatments including reverb and delays, while eliminating unwanted clicks, pops, hissing, buzz, hum, etc. I try to use a mix of digital and analog equipment to get the best of both worlds; the rounder, warm tones of tubes and transformers combined with the high-powered effectiveness of digital capability. I have a very reasonable hourly rate. It's at a discount for the quality of work you'll get because I'm young and sassy and full of vim and vigor. Yes. I'm happy to work within a budget. No project is too small (or too big). We can get as fancy or keep it as minimal as you need. Email me for consultations / estimates.